I just got 5 dwarf frogs today. I'm new to them but did research and had the tank set up properly. It’s a 10gallon with only the frogs, a clay pot, hidey, and silk flowers. It has a bubble stone and a filter-however I can’t use it right now because the current is too strong. My concern is that since putting them in the tank, 3 float on top and don’t stay down even when nudged down, and two stay still on the bottom. Is this normal for new frogs? Do they need a de-stressing period? Sadly, I lost 3 froggies but the other 2 seem to be doing ok. I went today and got a new heater, the filter you suggested, and some live plants. I still can’t get them to eat though. I’m feeding them freeze dried bloodworms and ReptoMin sinking aquatic frog granules. I’ve tried putting the food right in front of their faces but they don’t take it, just swim away. Any tips? I got a couple of African dwarfs and immediately fell in love. We had them in a 3 gallon tank, no filter and managed to keep them alive for 5 months with daily water changes and watching ammonia very carefully. I think i have gone overboard testing ph twice a day ammonia once a day, and the tank obviously never cycled. So, I have been trying to cycle the system for almost 2 months, nada. I put the waste water from changes into the new tank for over a month with no change 0.25 - 1.0 Ammonia,0 Nitrites,0 Nitrates. suggest that) 50% water changes once a week. Even if I get the ph to 7.0 - 7.2 in one day it is back to 6.0. My guess is it is the Fluval substrate, as I have found out it is for lower ph systems. The plants love it and flourish, the frogs seem ok, but I worry its too low. Should I remove the substrate and go with sand or gravel? <If you've invested a lot in the Fluval substrate, you could certainly persist, though with the addition of some commercially available buffer. I got a male for the two females, but we lost him, I feel this was because of the ph level. I had a large tank full of ADFs several decades ago (30 gallon tank with 15-20 frogs) and loved it back then. I recently decided that a small tank with a couple of frogs would be a fun Christmas present for my kids to enjoy. Right now, we have a 3 gallon Marineland “Nook” tank with two frogs and one small (about 5 mm) Horned Nerite Snail to take care of any algae since there isn’t room for big tank in our current location. I initially had the filter power/speed near the highest setting because that’s what the instructions in the box said to do, but I noticed that the frogs seemed to be very disturbed and unhappy with the rapid water movement on the high setting as it would frequently grab them and throw them to the bottom of the tank, and then they would panic and hide for an extended time. I turned the water flow setting on the filter almost all the way down and they have been a lot happier and acting normal swimming around and doing “froggy Zen poses” while resting. but it can be difficult to obtain in our area since I have only found one small pet shop that carries live worms, and they are frequently out of stock. and the frozen bloodworms are very messy, so I have the shrimp so I can let the kids feed the frogs some of the time. The diet seems to be working OK for the frogs as they are growing very quickly, and they actually seem to be more active and aggressively ‘hunt’ the shrimp while they just wait for the worms to come to them. In the 7 weeks since we set up the tank, the frogs have grown to more than twice their initial size and appear to be nearly full grown now, and based on identification guides it looks like we have one male and one female. Water quality tests using Marineland’s 6-in-1 test strips that came with the tank say that there is zero Nitrates, zero Nitrites, 150ppm Hardness (Hard), zero Chlorine, about 150ppm Alkalinity, and about 7.4.-7.6 pH. A Tetra HT10 submersible heater keeps the water at a constant 78 degrees. The frogs do seem to be doing well, but I have a couple of questions to make sure they have the best environment we can give them since I am either finding conflicting information online, or no info at all, and I can’t remember the exact details from when I had the big tank a long time ago. First, is the steady but fairly low water movement from the filter OK since it’s a rather small tank, or would it be best to turn up the power a bit to increase the filtration and just let the frogs deal with being tossed around somewhat when they swim right under the waterfall? Second, the water in our home is fairly hard and I wonder if the hard water is OK for the frogs or if I should use a water conditioner before doing 1/4 tank water changes every week or two. Third, I have found various sites that say the ‘ideal’ pH for African Dwarf Frogs should be anywhere from 6.0 to 7.8. Is the current pH of 7.4-7.6 a good range or should I use a pH balancer to get it closer to or lower than 7.0? Finally, my wife and kids want to add another pair of frogs to the tank and I’m wondering if that would be OK as long as we keep it clean and stick with regular water changes, or are 4 frogs too many for a well maintained 3 gallon tank? A bigger tank would be better, of course, but isn’t really an option right now. Thank you for the quick response and the helpful information! yet disappeared a few days later. Yesterday, it was back and very bright in color, so I started to research. Many, many hours and countless websites and articles later I now know there is more to it and am doing my best to provide a more humane existence and hopefully help them if they are ill.
as my step father offered it to me in lieu of the cube after bringing them home. I have been doing daily water changes as it gets extremely murky after their feeds of frozen bloodworms every other day. I have been putting them through so much stress and trauma over and over unwittingly. I again had no idea this causes the tank to have to cycle all over again, likely spiking and lowering the pH level, etc- which is torture to these frogs. So, moving forward I would like to get them a proper living environment. I am on a *very* fixed income as I am single, sole support mother who works 3 part time jobs. I cannot simply pop over to a pet store and make hundred dollar purchases without adequate planning and budgeting. From what I've read, most of the issues folks seem to have with smaller aquariums and their aquatic life is inadequate filtering. The water temp is currently at 74. Is this OK, until I can also purchase a heater? In terms of the body redness, today it seems to be gone and the frogs do not have other symptoms so I am unsure whether it is "red leg", an "opportunistic bacterial infection", or stress related from the water changes and likely ammonia/nitrite spikes. They seem quite depressed, yet have very good appetites, thankfully. Also, when they first came home, the male would sing in the evenings. He no longer does this but I am hopeful if there has not been too much internal damage, they might resume healthy behaviors and even mate. Please share any and all thoughts. Yes I have read the link (and about a hundred others on your website since yesterday), hence my statement that I am looking to get them a filtered aquarium. The question that I had is if I do purchase a small tank (i.e.. 2.65 g), with adequate filtration, will that be enough to give them a good quality of life (with all of the other elements in place that keeping African dwarf frogs entails)? Also you said, "all of the above"- do you believe they have a bacterial infection, and red leg, despite not showing other symptoms as described when I research these illnesses? I am a bit confused by your catch all response. Craig's list is an excellent idea, thank you. Making my own set up is also an option. Regarding having the time and means, taking care of dwarf frogs, from what I've read is not extremely time consuming, nor expensive- one simply has to be schooled on how to care for them and their needs. I am considering a "workable path", which should be quite explicit. Tonight my adf's were mating! I had never watched it before so was quite fascinated. Although I've noticed two things: My male's body looks very red all over (along with the very swollen and protruding white glands under his forearms). Is the redness an evening thing, a mating thing or my prior fear of some illness? The female does not look red at all, although there is a pink patch under one of her forearms that looks raw as though she rubbed it on something. then quickly dart to the top herself for a breath of air. My main concern is that if she is ill, perhaps she is unable to complete the ritual by swimming to the top with him attached. But, what do I know. This is all quite new to me. On another note, they absolutely love the earth worms my son caught for them and I chopped up into small pieces. everything will continue to go up for them health wise. Perhaps the apparent redness was simply a stress reaction in their fragile bodies. Or, it is the beginning stages of a fungal infection, as there seems to be very tiny white spots on their bodies- although again, I have never studied dwarf frogs this much and so intently, and scrutinized every single inch of their body so thoroughly- it could be perfectly normal but I would not know. Frustrating indeed. Any and all help clarifying would be greatly appreciated. How long does Amplexus usually last? Last night after my male (Hidey), successfully mounted Oval (female) 3 times, he then proceeded to sing all evening and late into the night and try to mount her (unsuccessfully) numerous times. Right now, I just saw them mating again! Although still no egg laying at the top, simply him holding onto her and staying quite still except for a few small swims and then throwing him off again. I just checked and they are at it again. Is this normal behavior? Yes you are quite right, my time and attention is in great demand but I committed to providing a home for these little ones and I intend to. Not to mention, we have grown quite fond of them. I also love the opportunity to learn, and this has certainly opened my eyes to the intricacies of aquatic life. Today, my little ones are swimming all about- do not seem depressed (hiding) as they were earlier in the week. Thankfully the earth worms are proving to be a success and do not muck up the water so I can leave them be for a few days! In the 1g bowl they are currently in, how often should I change out the water and how much of it at a time? You mentioned not more than 50% and "for stored (for a week or more if you have the room, containers);"- are you able to clarify a bit? While at the pet store Friday I purchased a tap water conditioner (Nutrafin Aqua plus) and a biological aquarium supplement (Nutrafin Cycle), both of which seem to have improved the water quality at least for the short term. The bottle recommends adding some each time I do a water change (but the prescribed amount is for 10g tanks), would you recommend this also? Shall I purchase a water tester kit (pH, ammonia, nitrates, etc)? Also, thank you kindly for getting back to me and helping to guide us through this. In the very near future I will have a much better home for them (bigger tank, filter, heater), but in the short term, I would like mitigate any harm as much as possible. I understand now why they need more space than a tiny cube. I am now considering trying to obtain a 5g tank if possible. They are mating constantly, swimming most of the day and seem quite a bit different than the hiding pair I've had for the last several weeks (we even named our male after the fact that he hid most of the time- much more so than the female). This weekend he has swam more than I've ever seen, and when still, struts his body and opens his gullet in this comical way just before he makes his call. The female tries desperately to get away from him it seems. At times she nudges him with her nose, pushing her body just under his (it is so sweet to watch), and other times virtually ignores him, swimming away as soon as he approaches. begin to respond to environmental stress, similarly do frogs' (all creatures), and it can be relatively easy to rectify if properly informed (which it seems your site does well). I appreciate the copious data the website provides and your personalized answers to my queries. Hi! I got an ADF about 3 weeks ago. The pet store that sold him to me had them in a community tank with platys and mollies. The salesman basically told me they are just like caring for the other fish I have except the diet. They didn't have a book but plenty info online and there was nothing to it. Clearly I'm not a pro. Here's my what my 10 gallon tank includes (salesman told me these were all perfect), pair of platys, pair of mollies, Cory cat, Chinese algae eater and a few fry that haven't gotten big enough to mess up our balance yet. Our feeding routine is, we feed frozen bloodworms every other day and flakes every other day. I was originally told to feed to frog twice a week. The frog doesn't eat the flakes, sometimes he tries them but spits them out immediately but he is healthy looking and doesn't look underfed. I think he may snack on the fry, the platys are breeding like crazy but haven't produce many fry that survive since the frog moved in. The conflicting information is maddening! I learned too late that the mollies aren't ideal tank mates. to be healthy and happy. My question is, since it will likely be 2 months before we get the bigger tank up and going, what can I do to keep everyone safe and happy in the mean time? We really just love this little guy and I really want him to stay well. Apparently I've done basically everything wrong so far. Also, I read that the frog can live 5 years but another site claims they can live much longer. What is their live expectancy? So I have a 1.1 gallon tank with a mystery snail a male crown tail Betta and an African dwarf frog his name is flippers. He was all fine swimming around earlier but I just found him upside down on the bottom of the tank so I scooped him put and put him in a tiny container with new water and stuck it in the tank but not exposed to the rest of the water just so he can get the heat from the light. in fact my snail has grown a lot in the while I had him. There's algae on my tank but I figured itd just a plant it wouldn't hurt anything. The frog isn't skinny I see him eat the Betta pellets and frog food. What would cause him to go from alive and fine to dead with in like 8 hours. The tank is dirty with algae is that what killed him? and dead frogs after as few weeks or months, so we can ignore their advice. For sure some people keep Bettas in jars, but they're breeders in heated fish rooms who change 100% of the water every day. Not practical if you're a casual hobbyist who just wants a pretty pet fish. Get a filter. An air-powered sponge filter is all you need, and better than a small internal canister filter. Don't get a hang-on-the-back filter because these have an opening through which Bettas often jump and frogs almost always escape, winding up as dried "carpet jerky" as we say in the trade. ADFs and other aquatic amphibians should never, ever be kept in open-topped tanks unless such tanks are only half filled. Seriously. The risk of them jumping out is extremely high. So, we've covered aquarium size, heating, what else...? but earlier it stuck this giant tube out of the water and did a heave like thing. And the snail is a mystery snail. I've only had the frog for a month or so and no one nips at anyone, I don't have room for a much bigger tank. It has an under gravel filter and it stays in the bathroom, which is the warmest room in the house. And I never turned the tank light off. It really does keep tank warm. And its waaaaay better then the unfiltered beta bowl that the fish was in for a while. Question: there is possibly a 2 to 5 gallon tank in my garage..... can I use the under gravel filter in that even though it won't cover all of the bottom? <Nope. Water flows through the line of least resistance. So if you don't evenly cover the filter, the water will mostly go through the exposed part of the filter plate because that's "easier" than going through the bed of gravel. Make sense? Since gravel costs virtually nothing, a buck or two should be sufficient for enough to cover the undergravel filter plate here. Waiting for the thermometer a bit longer. What do those levels mean. Could they have killed my frog. I cannot afford a bigger tank for another few weeks. So no more froggies until then. I did however buy air stones to put in the filter tube... the pet shop guy said it might put a little more oxygen. Should I return them or will they help anything for now? Also bought something called a internal filter ceramic ring. It says it helps maintain water quality by converting harmful waste into harmless compounds. What do you think? Try or return? Can you please tell me what the water quality strips numbers mean, whats normal. How to fix if too high or low. The package wasn't very helpful. <NH3, NO2 are ammonia and nitrite respectively. They must always be zero. mineral content. In general terms, low levels of both is good for things like tetras and barbs from soft water habitats, and high levels for things like livebearers and Central American cichlids from hard water habitats. I still don't understand why the frog died. The first snail I had died too. I took it to the pet store they said he wasn't dead but minutes later his flap thing fell off. But it makes me worry because that snail only stayed on the pink castle I have. The fish doesn't touch it the new snail has been on it but he likes the walls. The frog would sit in it. Is there a possibility there Could Be lead paint? Especially because it's pink. Do you know of that's even regulated in the us. How would I even test for that? Cause I have no idea why they both died. Cause if the water was fine then what was it? Could it really seriously be the tank is too small. They're getting a bigger one anyways. <Then it's an academic discussion. Review the needs of African Dwarf Frogs (nocturnal, fussy feeders, easily damaged) and plan accordingly. They're actually cute and rather loverly pets, the males even croak a bit in the evenings, but they aren't "easy" pets. Doubtless much written online, as well as here at WWM. Ok so im going to get a bigger tank in a week or two when I get some money. 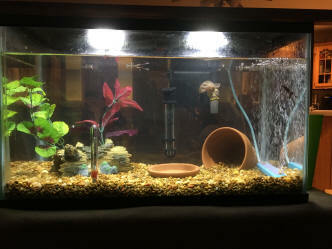 I saw this awesome 8 gallon bowfront tank for 45 dollars with everything: filter, heater, hood, lights. You are not in the US are you? temperature, anything. It seems like everywhere else knows [[sidetrack]]. If I were to just put the snail in there (keep the Betta in his own lonely tank) how many African dwarf frogs could I put? What about a 5 or a 10 gallon tank? I am not ready for the idea of snail babies, but tadpoles...yes, but i want to research first. Besides the males croaking how do I tell what gender the frogs are? How do I tell a snails gender? Do you think the pet store people could accurately tell me a frog or a snails gender? Are frogs and snails about equivalent when it comes to how many I could put in a tank? Do you have any good links on info of African dwarf frog breeding? Can my Betta stay in the 1 gallon tank and be ok? I found out that if I turn on the heating lamp in the bathroom where the fish tank is and cover the tank with a towel the temperature is fine. And that the tank light does keep the tank warm enough during the day without the heating lamp. Im still upset I don't have a straight forward cause of death for the frog. <Indeed. But the problem with environmental stress is that the immediate cause of death doesn't tell you much about what went wrong. For example, a drunk driver crashes into a tree, the tree falls down and kills him. The cause of death was a tree hitting him, but that wasn't the reason he died. I have been lucky enough to have quite a few awesome frogs in my life but this little guy I have now is really neat and I am curious about his features. this normal? Google is failing me on the four claw search. <In all likelihood you have a "sport of nature" as Darwin would call them, one of those odd bits of genetic variation we see among animals and plants. Thank you for all the wonderful, informative info you have on your site. It is priceless! I am another victim of Pet Smart's uneducated sales people. We came home with two African Dwarf Frogs 10 days ago, and already one is dead. After poring over your website I realize now that we did not have a big enough tank (2.5 is what they told me to buy), we should have bought a heater (they said I didn't need one) and furthermore we are over feeding and not giving them a diverse enough diet. I think the poor guy had that Red Leg disease. Thanks to WWM I am making the hour trip to Pet Smart tomorrow to buy a bigger tank, a heater, sand (instead of the gravel they sold me) and to get 2 new frogs. They are taking back the dead frog and the guy that is still holding on, but doesn't look too good. So now for my questions: how should I safely transport the frogs back and forth to the store and to my house? two times a day (I believe you say every other day and to switch between pellets and brine shrimp). There was additional information on their pamphlet that contradicts what you say on your website. Thank you so much for your reply. Mi know how busy you guys must be. Unfortunately, I got the email after I already went to PetSmart and bought a bigger tank, a heater, and one new frog to replace the dead one. There was one surviving frog from my original 2, so I kept him. Anyway, bought all the new stuff, had my water tested and brought the frogs home. My water tested perfect for everything that you say they need. We have a well and not town water so no chlorine. But I had both the conditioned tank water tested and water straight from the tap. They were basically the same. Bought guys home, set up tank, thermometer, filter, etc, did not condition water and voila. 24 hours later one guy seemed very lethargic. He hardly moved from this spot right against the heater. I was worried he'd be burned, but the PetSmart folks said the heater was safe. I moved him a bit and he rested on a plant, but again, very lethargic. This morning, 36 hours after bringing them home, both ADF are dead. I am horrified and being that I am working so hard on this, I just don't understand what I've done wrong. Let alone that my son is going to be miserable. The first frog that died last week definitely had Red Leg. I didn't notice that on these guys. I have a dwarf African frog (obviously) and not in the best environment. my 25g is medium planted with plenty of hiding places, but he shares the tank with Amano, cherry, and ghost shrimp, 3 dwarf Mexican Crays, countless red Ramshorn snails (getting fewer with the puffer), and a dwarf puffer. that being said I feed the tank live blackworms (2-3x week), API Bottom Feeder pellets (a few each day), and frozen bloodworms or brine shrimp (alternate about every other day - but never on same day as blackworms). The frog eats the frozen occasionally but always eats the blackworms readily, even seems to hunt them. question is, is the frog fine with eating "almost" exclusive blackworms? I've read that they may be too fatty and fatten him up to the point its hard for him to get to the surface? I have 2 African Dwarf Frogs at home in one of those little units from Brookstone, with a snail and a plant. <Unfortunately for you, these kits are overpriced rubbish. I have 2 more at work who up until yesterday were in the same setup minus the snail. With no snail their watery world was getting pretty green, so I moved them on up today to a 5 gallon aquarium along with their bamboo plant. <The upgraded tank is definitely worthwhile. The bamboo not so much, and really, not likely to do well in the long term. Another gimmick really. The bamboo plant still has some algae on it, and I'd like to bring the other 2 frogs and the snail in to join them. I am concerned about 2 things - how soon to do that so as not to overstress the millionaire frogs, and 2, whether the snail and frogs will survive the 20 mile commute to my office (or me, while trying to keep them from tipping over and driving too!). <If you transport the frogs safely, this should not cause them problems. Right now the frogs at home are in a nice clean tank and seem OK, but I know it's like living in a pup tent for them and I see how absolutely delighted the work frogs are in their new watery mansion. Any advice on my 2 concerns? My goal is frog happiness and a snail to do some clean up work at work! One final question, if I bring in an algae eating fish like a mini catfish, how soon should I do that for the new tank and what type of algae eater would you recommend? <There are no algae-eating fish suitable for a tank this size. The retailer will doubtless sell you an Otocinclus, but that's a schooling fish and very delicate, and not at all suitable for this tank. The bigger algae eaters like Ancistrus are even less suitable. Without fast-growing plants all tanks become algae-ridden, and nothing beats an algae sponge or scraper. Thank you. I have another question how many times should I change my tanks water and how much of it? Answers to both questions are there! In fact, read the whole article, and check you're keeping your frogs properly. I work in a toy store and we received a shipment of frogs today. I already hate the idea that these frogs are shipped to toy stores, I have the idea even more when I open the package and find that they company allowed the animals to be shipped in the cold weather, nearly freezing them to death. Anyways, as I was distributing the frogs into their tanks, I came across 3 frogs that were floating upside down when in their tanks, but they were breathing and moving around when I removed them. I promptly put them into a very shallow tank of water (about 1/4 in) to allow them to warm up. When they were moving a little, I added some more water (it was then about 1/2 in)... just enough to cover their bodies, but allow them to breath without much effort. It took about 5 hours for them to get a bit more active, but I took them home because I did not trust the guys at the shop would not just flush them (as they had threatened when the frogs arrived). I have now moved them into a modified beta tank (1/2 gallon with lid and ventilation that they cannot escape from) and they have variable levels of water. I have an area just over an inch in depth and then some rocks piled up so that they can relax and be near the surface. I know that they will need a bigger tank and I have one ready, but I just want to be sure they are alright before I transfer them. 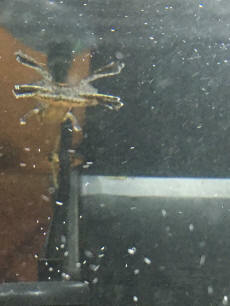 Now that you have the back story, my question is this: they have been spazzing out since I put them into the beta tank. (no beta, just 3 frogs) and I am concerned that they are hurting or something. The jump on each other, try to jump out of the tank, hit their little noses on the wall, and just flail about. They simply will not sit still. It is now 10 pm and they have been at it for about an hour now (since I transferred them). Is this normal behavior or should I be concerned that they are drowning or something? They are all still all upright, but very much acting crazy. BTW, we used spring water from the market, the same water we had used with all the other frogs at the store. I would appreciate any help you can give me as I am very new to owning any amphibious creature. Well all 3 frogs died last night. They were acting like they could not get any air so I added more gravel to the tank to give them less work getting their heads out of the water. They have not eaten since I got them (about 2 days ago), they would not even pay attention to the food. I feel just awful because I was trying to save them from a bad situation, but they died anyways. Was it something I did, or do you think they were already destined to die when they got shipped in freezing cold water? I have always wanted to have an aquarium and I like little animals like frogs and lizards, I am just afraid that I do not know well enough how to care for them since I could not keep 3 little ones alive. What do you think? <Hymenochirus spp. frogs are actually very, very easy to keep provided you "go by the numbers". A 10-gallon tank, initially half filled with water, with an air-powered sponge filter, a small heater, and a clump of Indian Fern would be a cheap, easy way to keep them alive. Buy a few wet-frozen foods from the pet store: bloodworms, brine shrimps, Tubifex, mosquito larvae. Rotate between them, feeding every other day (done this way, such foods will last six months or more, so this is a very cheap option). I am getting an African Dwarf Frog soon. Could you please tell how to care for these guys?? P.S I've heard that African Dwarf Frogs can swallow pebbles if they are small enough. Are regular aquarium pebble too small for them?? I am hoping you will be able to help with all of your combined knowledge. I've had a little African dwarf frog for about two weeks and he's become lethargic the past four days or so. He lives alone in a one gallon tank and I am wondering if he is lonely. Is that a possibility? He seems in good condition physically, no wounds or sores. And he has shed his skin once already. He's been fed HBH pellets, as he didn't do so well with frozen and dried bloodworms which did not sink and he was unable to find. His appetite isn't great, he eats about two pellets every day. Some of the information I've read seems to think that is normal, so I am not too worried about that. The water temperature is around 70-72 and I've treated the water (which I let sit out over-night) with dechlorinator which also includes some protection for the skin. I've also provided him with plenty of hiding spaces and he's not too far away from the surface to reach the air. So my concern is that he hasn't been swimming around much or active like he was for the first week. I did change 25% of the water (and cleaned the rocks since there was excess food from me trying to figure out how much he would be eating). He just seems uncomfortable and a little unhappy. He does not respond like he used to, and he doesn't seem to be afraid of being scooped up by the net like he was initially. Thank you very much, Neale. The thawed, frozen bloodworms are hard for him to find since they don't sink, even when I put them in with a turkey baster. Any other ideas? I had read in a number of places that one gallon was plenty for ADFs and that they were one of the few aquatic animals that would be happy in a small tank. It makes me very sad to think that I've caused him harm by keeping him in a home that is too small. Most of the "experts" I spoke with said the home I gave him should be perfect. I will take one of the plants out and give him more space to swim while I work on upgrading his habitat. No, they weren't trying to sell me anything, the bowl with all the stuff to go inside was a gift from my little cousins, so I felt obligated to use it. So, I researched what could live in it comfortably... talk about something backfiring! I sincerely thank you for all of the advice, and I'm sure "Sunny", the ADF, feels the same way. You've been a great help!